Installing An Effective Weeping Tile System In Vermont & New Hampshire, including the areas of Keene, Burlington, Colchester. Installing a weeping tile system is an important investment in the value of your home. Hiring the wrong contractor or choosing the wrong system can lead to a flooded basement and a major eyesore along the edge of your floor. Choosing the right weeping tile system (also known as a "French drain") for your home can mean the difference between a clean, dry basement and one that's flooded. Like most other technologies today, weeping tile has come a long way in the past few years. Modern installations install more quickly and have better results than ever before. Which Weeping Tile Systems Are Best? At Northern Basement Systems, we're proud to say that the drainage systems we provide meet all of these standards -- and we stand by our systems with a written, transferable warranty. We offer expert weeping tile installation. For a free basement waterproofing quote, call or e-mail us today! We serve Burlington, Keene, Colchester and many areas nearby in Vermont and New Hampshire. If you're planning on finishing your basement or using it as storage, you'll want to be able to rely on it to be a dry, usable space -- and stay that way. If you can't count on that, then you probably won't feel comfortable keeping valuable or irreplaceable items there, such as photographs, furniture, or winter clothing. To help you decide which system is best for you, we've compiled a list of Weeping Tile "DO's and DON'Ts" that we've seen many other homeowners learn about the hard way. DO Install Your Weeping Tile System Out Of The "Mud Zone"
After your foundation was built, the builders of your home used soil to fill in a level space for your concrete slab floor. Any weeping tile system that's installed in your home should be kept above that layer of dirt to prevent clogging. If weeping tile is placed directly in mud, some of that mud will wash into the system. Eventually, this will build up, potentially leading to a clogged drain. At Northern Basement Systems, we prefer to install our drain systems out of the mud zone to help keep the system working properly. Whether your basement walls are leaking now or not, you'll want your system to be able to collect water that floods through cracks, seeps through the concrete, or leaks through the basement windows. Many contractors will try to address this issue by installing a large open gap along the entire perimeter of your basement floor. This is the right idea and the wrong approach to this challenge. A better approach is to include a wall flange with your drain that extends above the floor by 3/8". By including this in your system, you protect your drainage channel from dirt and debris swept in from the floor. If we're also installing one of our basement wall products for you, we can integrate the wall system with this flange, so that all water from the walls is directed to your sump pump. Some contractors will avoid installing a sump pump by designing a "gravity drain" to drain water away without any mechanical components. While this does work in some uncommon situations, Basement Systems prefers to drain flooding water to a sump pump. To work properly, gravity drains must be directed downhill. If your basement is underground, it is very unlikely that this will be possible for you. A sump pump system can be used on any home -- the pump will always be able to pump the water away, no matter how far underground your basement is. Sump pump systems also clog much less often than gravity drains do. As the water is being pumped out of the system quickly, rather than trickling downwards with gravity alone, there is much less time for sediments to build up on the bottom of your discharge pipe. Additionally, a sump pump can remove much greater volumes of water when compared to a gravity drain. At Basement Systems, we've observed that drainage channels being overrun with overwhelming amounts of water is one of the top three causes of basement flooding. There are some contractors in the business that will insist that the only way to waterproof a basement is from the outside of the foundation. Installing weeping tile along the base of a foundation will require the contractor to excavate your entire basement, exposing the base of the foundation so the drain can be placed there. This excavation process drives up the installation's cost dramatically. It also means serious disruption to everything on the outside of your home, including gardens, sidewalks, patios, and other landscaping. After the drain has been installed, the dirt will be returned to the hole, piling up on top of the drainage system. Eventually, some of that dirt will make its way into your drainage system, leading to clogs. Once the system is clogged, the only way to service it is to dig out the foundation again. You can save half the cost of basement waterproofing by installing your system from the interior instead. Interior weeping tile installation will not disrupt your yard or landscaping, and the entire job can usually be completed in a day or two. Remember that old adage "Jack of all trades, master of none"? That certainly applies here. Much of the work of professional waterproofers is to fix the failed waterproofing attempts of plumbers, contractors, and homeowners. Waterproofing is a major home improvement investment, and it's best handled by a professional. We recommend that you speak with a certified waterproofer about your problem before making a final decision on your home. Professional waterproofers are experts in the industry -- this is what they do every day, and they do it better than anyone else. Additionally, a reliable company will offer a written warranty with their system -- one that can be transferred to the next owner of your home. This is a major bargaining point when selling your house! Many homeowners are deceived by the lower cost of PVC pipe materials when compared to a more modern drainage system. At Basement Systems, we strongly recommend against PVC drainage systems for basement applications. They don't work well, and they'll cost you more in the end. Modern weeping tile systems have been drastically improved over old-fashioned PVC pipe. They install faster, and they fail less. Large, clumsy PVC systems will require the installer to jackhammer a larger section of your floor and dig deeper along the floor to install the pipe. After the jackhammering is done, there will be more debris to remove from the basement. Once the pipe is installed, more of your floor will need to be restored with new concrete. While the ticket price of PVC pipe may be lower, you'll pay more once the work is done, the debris is removed, and the extra concrete is placed. So you didn't really save any money at all! Which Weeping Tile System Should You Choose? It's important to remember that all basement water problems are different, and there are many challenges that a waterproofer faces when designing a system. We have six different drain systems, many specialized to address a specific challenge that we encounter when waterproofing a basement. The chart below will give you some pointers on which of our weeping tile systems might be right for you. Click on the name of each system to see what it looks like and learn what it can do for you. We Install Warranted, Proven Weeping Tile Systems! Northern Basement Systems is your experienced contractor for the installation of a weeping tile system that's perfect for you -- no matter what your water problem is! If you live in the Vermont and New Hampshire area, we'd like to offer you a free weeping tile installation quote that's custom-designed for your basement. Each of our free quotes includes a personal inspection, cost quote, and a copy of our 88-page full-color waterproofing book. Contact us today to schedule your quote! 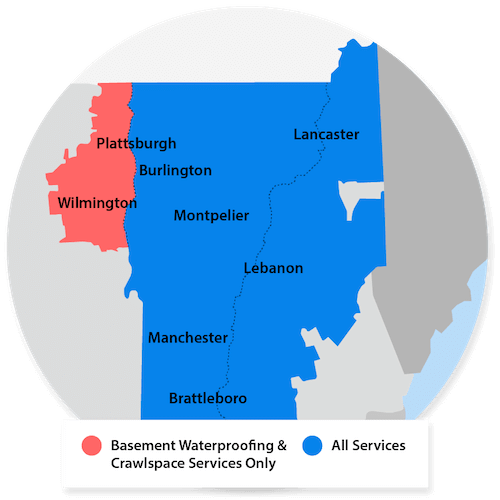 We proudly serve the Keene, Burlington, Colchester area, including South Burlington, Laconia, Rutland, Brattleboro, St Albans, Montpelier, Bennington and many areas nearby. Generic weeping tile systems are typically made with round sections of PVC or plastic hose. They can be installed on along the perimeter of the foundation walls, from either the inside or the outside. These types of weeping tile are much more likely to clog with mud and debris. And if it's been installed along the outside of the home, it will not be accessible without excavating the foundation. This type of drain is also inappropriate for unique problems, such as iron-ochre-laden water. Generic weeping tile is also not designed for basement waterproofing, and its shape makes it more difficult and labor-intensive to install. The installation will create more waste, and additional concrete will be necessary to patch up your concrete slab floor. Our most popular drainage system, WaterGuard® is our most versatile system, and should work in most waterproofing scenarios. WaterGuard® is the ideal solution for most basements, providing a below-floor system that is located outside of the "mud zone". Once the system is installed and the floor has been restored, the system is nearly invisible. A unique wall flange extends from the system, collecting water from the walls. This wall flange can be integrated with any of our line of basement wall products. WaterGuard® installs quickly, effectively, and includes a lifetime written transferable warranty against groundwater seepage with each full-perimeter system. If your home has been built with monolithic foundations, or the floors are exceptionally thick, this weeping tile system has been designed for you. At Northern Basement Systems, we know that monolithic foundations are designed with the floor and foundation footing poured in one piece, and that these floors require special treatment. Jackhammering a monolithic floor is extremely labor intensive, and it creates a log of noise and dust. For monolithic floors, we recommend installing our DryTrak® Perimeter Weeping Tile System. This drain attaches to the perimeter of your basement above the floor, collecting water from the wall-floor joint. This way, no jackhammering (or the dust that would come with it) is necessary. In our business, we often hear from homeowners who have moisture entering their basement through leaky hatchway openings. While this flooding is often a minor concern, it's certainly something that the customer would like fixed. Our custom-designed TrenchDrain system is ideal for this kind of situation. With a grated-top design, it installs flush with the floor and collects leaking water before it can flood into your home. The drain is tied in with your perimeter weeping tile system, directing all flooded water to your sump pump. In some less common cases, a home with high iron or manganese levels in the groundwater around the foundation will have iron bacteria growing in high concentrations in the water. Iron bacteria crates iron ochre, which is a thick, rust-colored substance that oozes onto the basement floor. Iron bacteria is present across the globe. It presents no known health issues, but it is know to have a foul smell, and it can stain anything it touches. Iron ochre is infamous for clogging up plumbing and drainage systems. That's where the WaterGuard® IOS weeping tile system comes in. This drain includes wide openings and a completely removable lid. Should your system clog with iron ochre, the lid may be removed and the ochre cleaned out to restore your system to working order. At Northern Basement Systems, we recommend installing a weeping tile system along the interior perimeter of your foundation walls, underneath the concrete floor. However, if your basement's floor slab is extremely thin, it may be difficult to "hide" your drain beneath the concrete slab. In these cases, our dealers with recommend our FlowGuard Thin Floor Weeping Tile System. FlowGuard collects water entering your home through the walls and the wall/floor joint, directing it to a sump pump system. However, its unique, thin design allows it to be placed in front of your foundation footing and underneath the floor. The surface can now be covered by concrete, for the best of both worlds! Most crawl spaces have dirt floors, making the "mud zone" the only zone for your perimeter weeping tile system to be installed in. In these cases, the most effective choice for your home is the SmartPipe™ Crawl Space Weeping Tile System. This system is the ONLY system of its type that's custom-designed for crawl spaces. It's installed within a drainage swale along the crawl space perimeter, with five rows of perforated drainage holes collecting floodwaters. A clog-resistant fabric filter prevents clogged drain issues for maximum drainage. The SmartPipe™ is a efficient and cost-effective approach to keeping your crawl space dry all the time!